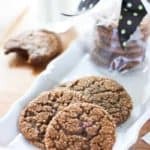 These easy to make chewy cookies will be a hit any time of year! 1 cup 'Sugar in the Raw' to roll cookie dough balls in. With an electric mixer, beat the butter and brown sugar until light and fluffy (about 2 - 3 minutes). Add the oil, molasses, egg, and vanilla extract and beat until incorporated. In separate bowl, combine dry ingredients. Flour, soda, salt and spices. Mix well and add to wet ingredients. Beat with electric mixer until well combined. Cover and chill the batter until firm (about 2 hours or overnight. I chilled mine for 2 hours and it worked great). Preheat the oven to 375 degrees F. Line two baking sheets with Silpat liner or parchment paper. Place 1 cup of raw granulated sugar in a medium sized bowl. When the dough has chilled sufficiently, roll into 1 inch balls. Then roll the balls of dough into the sugar, coating them thoroughly. Place on the baking sheet, spacing about 2 inches apart and, with the bottom of a glass, flatten the cookies slightly. Bake for about 9-10 minutes or until the tops of the cookies have crinkles yet are barely dry. (They will look a little underdone.) Remove from oven and let cool 5 minutes. Place on a wire rack to continue cooling. Store in an airtight container for up to a week.